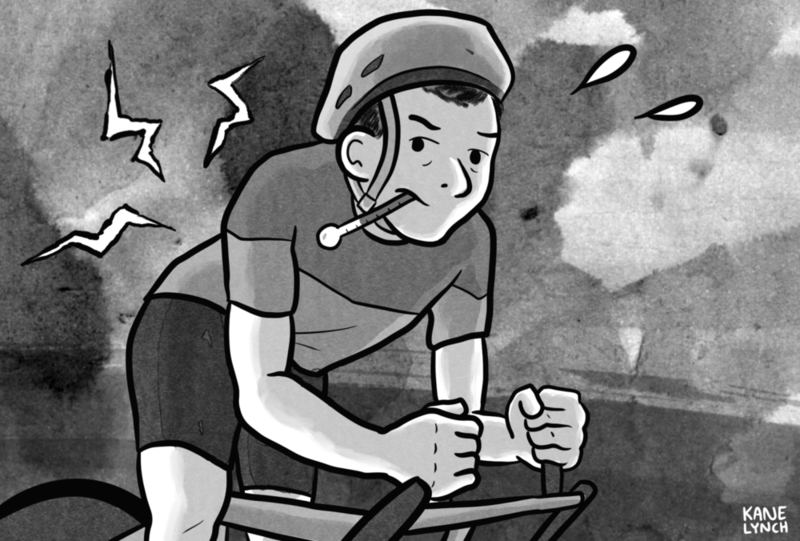 I have spent the past six months mildly, and on occasion, intensely, hating triathlon. No posts since Los Cabos should serve as a testament to that fact. I came off last season tired, then accumulated some health issues on top of that. The common sense thing would have been to stop, heal and recover. Good luck with that concept, I never really warmed to common sense in any matters long distance triathlon. What is common sense about an Ironman in the first place, anyway? Consequently, I ended up showing up for an Ironman race in May with sciatica, an active kidney stone and inflamed hip rotator tendons. I threw massages and chiropractor adjustments at it in the days before the race, to no avail. On race day, I hobbled around on course, mostly angry and depressed the whole time. Then finished, with an unremarkable result, and a broken spirit. After returning home, I had more chiro. Then passed the kidney stone. Started physiotherapy for those hip flexors, I got some exercises to do daily, which I quit after a week. I continued to train, keeping my eyes on Ironman Mont Tremblant, our family favorite. Three weeks to race day I went for a long ride on the tri bike, and for the first time since May, outside. I ride inside these days, except for races. I decided to ride only until I started to really hate it. I thought that would come in an hour or two. I went early, and nature was beautiful. I thought of my friend, the Future Pro, who was racing his A-race for the year that same day, for Kona qualification. I wished him luck and tried to channel energy his way. I kept going for five hours, and felt … better. This past weekend I got six hours in, outside, on the tri bike again. A bear crossed before me, with two cubs. I stopped, gave them some room. I guess things are looking up. Time heals everything. Life is rolling hills, like the terrain we ride here. Almost half the ride at or above threshold... You got to love the guy... Funny thing is, I look forward to it. It is all in the training. 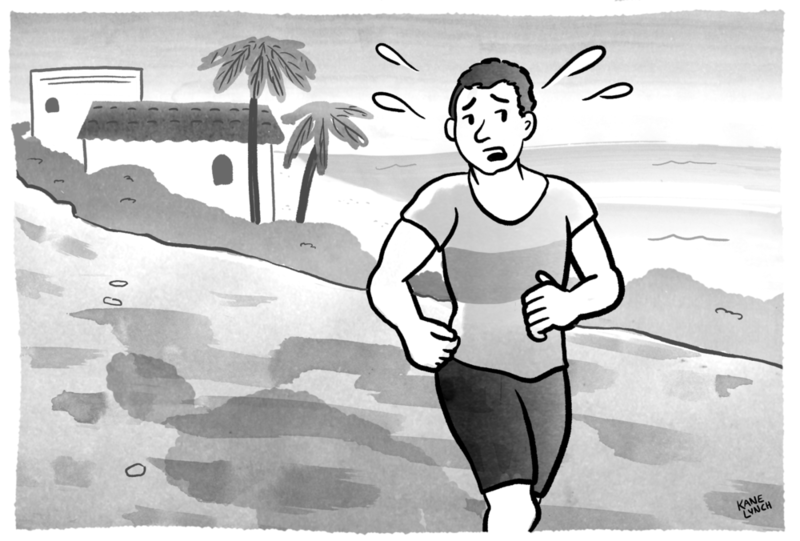 Most recently, I had to sneak into a gym, a glass enclosure in a hotel’s courtyard, and hour before it was officially open, and ran on the treadmill in the dark to remain undetected. I ran on a tropical jungle path in Singapore, knee deep in copulating monkeys. I swam several hundred “laps” in a 12-yard long kidney shaped pool at an airport hotel. I ran dozens of circles around the parking lot of another hotel, in sleet and snow. I biked on a tiny exercise bike in a hotel’s basement, until it started smoking. I once biked for 5 hours on a 5-mile stretch of road. I ran the bridges over the River Thames in London in a serpentine (many times). In general, I have amassed serious mileage running around airports, giant parking lots, industrial zones. And I also ran in some of the most stunning places I have ever seen, with street signs that I could not even read, not to mention understand, getting lost in it all…. Which is a great luxury, right? Pros in long distance triathlon are the most likeable athletes I ever watched. I genuinely like them all. There is little chest bumping among them. This is perhaps because they never really know what will happen to them in any race, whether they will win or DNF. They respect the race as much as we age-groupers do. That, and the fact that they race among us, at the same time and on the same courses makes them relatable, human. Their finishing times, of course, make them super-human. There are plenty of examples of the above claim – watch interviews with the pros, or watch them race. A great example easily at hand is Lionel Sanders’ blog post about his 2017 IM Arizona race. Read his post, then guess how he did in that race, then look up the result. How can you not like a guy like that? By the way, his blog is here: https://lsanderstri.com Look for his post titled “IM Arizona 2017”. Picking races for next year is always a fun exercise. Trying to figure out what destinations the family would enjoy visiting, what course suits my abilities, where can we get a bit better results than the usual, how much time is ideal between races, etc. is a challenge. It takes us weeks, sometimes months. This time around, however, the first race of the season was an easy choice. Pretty quickly we decided to race IM Santa Rosa in May, and try to raise some money in support of those affected by the wildfires. So, I signed up and started my fundraising page under the broader Ironman Foundation umbrella. All donations go to the 2017 North Bay Fire Relief Fund. Being a good soldier, I jumped back into training shortly after Kona and got ready for IM Los Cabos taking place, for the last time, in mid-November. I signed up early in the year, so thought I should go and get it done. In the back of my mind were Kona thoughts, 2018 Kona thoughts… I felt strong again soon after Kona, and the family wants to go back to the Big Island, both of which provided inspiration. I have raced Los Cabos before, so this was a known entity, as much as races go. Also, the field was small, giving all a better than usual shot at grabbing a qualifying slot. Finally, I like Mexico, for its people. I have always been received with friendship there. So, I went willingly, with anticipation and great plans. Of course, things never go to plan in IM racing. I was suffering mightily on the bike by mile 80, and it just got incrementally worse as time passed and the remaining distance shrank. Running was no better, then no option, I was reduced to walking, fatigued throughout. I dragged myself to the finish, a complete wreck. I should have felt deflated I guess, not living up to my own expectations, getting another slow time on the books… But I haven’t felt that. I still don’t. I have tried as hard as I could. I went far beyond what was comfortable, past the reasonable, getting to a territory that I have not been to before, beyond what would be considered safe. I feel good about daring to go there, and getting home afterwards. "Daddy, go to the basement and train 10 hours!" ... was the instruction over breakfast from my six year old daughter. It is her mission to go back to Kona. Preferably, next week. She would settle for the second weekend of October 2018, reluctantly. Kona was a fantastic experience. Surprisingly, for us the lasting memories have little to do with the race. It just turned out to be a superb trip. But let’s get the race out of the way first. We got in 5 or 6 days before race day. I assembled the bike and trained a bit. I stayed outside the areas where the serious athletes were conglomerating. Rode beyond the airport, once even near Hawi, swam miles away from Kona, to the south where we were staying. The little we saw of Kona during race week was madness. We needed none of it. Race day rolled around soon enough. I raced without goals or worries, just tried to enjoy the experience, not get in trouble. As a result, I did enjoy the experience, remember a good chunk of it, and all of it is positive. I was also slow, finished three quarters of an hour off my PB. I don’t mind it at all. Kona is a fantastic race, I do understand why people fall in love with it. Conditions were also favorable this year, so I even had it easy, relatively speaking. Ok, onto the good stuff. Hawaii is fantastic. We had one of the best vacations ever. We have seen sea turtles (often! ), snorkeled with amazing numbers of beautiful tropical fish, saw volcanos and lava fields, rainforests and waterfalls, counted chameleons on avocado trees at a coffee plantation. Our baby daughter learned to snorkel, and our teenager learned to ride a longboard. People were friendly. Food was great. The landscape staggering, mesmerizing. We jumped back into training after Tremblant. Six weeks to recover and train up to the world championship race which has a reputation of being the toughest race on the Ironman circuit. We also decided to make this trip into the family vacation we planned for later the year and for Mexico. I am happy to report that both goals were doable despite the little time we had. I got there properly trained and in good shape. Hats off to a coach who knows what he is doing and has first hand Kona racing experience. We also got convenient plane tickets, good hotels and rental cars at reasonable rates. No such thing as too late, I guess, when it comes to going to your dream race. Tremblant is our favorite race. I pick up the girls in Montreal on their way home from visiting grandma and then we drive up to Tremblant for a long weekend. We love absolutely everything about the village, the people, the race. We are lucky to have such a superb race in an easily drivable distance from home. This race was the first one after I “officially” stopped my campaign for Kona qualification. I raced free from the burden of Kona thoughts, pushed the swim and the bike, and survived on the run. I saw the girls several times, and those were by far the happiest moments of the race and more or less the only moments that I remember from the race itself. Well, except that I got my first bike penalty and spent 5 minutes standing in a penalty tent – I do remember that. My time was not my best, but it wasn’t terrible. The surprise came at the end, when results showed me in 6th place in my age group. That is about 20 better than my usual position. So, after some hesitation, I went to awards – the girls told me to – and waited to see what happens when they get to my age group. It took two hours to get to us older men, and I have almost left the tent several times before our turn came… Four slots were allocated to us, as ours is one of the biggest age groups in terms of participation, with almost 300 racing Tremblant this year, about 15% of the total field. Then things turned interesting. The winner of my age group did not claim his Kona ticket, which meant that his ticket rolls down to the fifth place finisher. Which also meant that I was just off going to Kona by one spot. Then the third place finisher waived his Kona ticket, rolling it down to the sixth – me. This almost gave me a heart attack. I could not believe that it may happen for us, getting to Kona on a roll down ticket. I waited until number four and then five claimed their tickets. Then Mike Reilly called my name. I rushed through the sea of empty chairs to the front, in shock, shaking, close to tears. I got a lei around my neck from a girl and soon had our Kona ticket in my hand. I texted the girls, told them we are going to Hawaii in six weeks. You never know what a race will throw at you - you do your best, then it is tossed into the hopper of who is there that day and in what shape, then your result comes out, and most likely on will surprise you one way or the other. I signed up for the Prouty charity ride, as I try to do every year. The day of the ride I left home early, added a 20-mile loop before starting the official ride course. I wanted to turn it into a 6-hour ride, as we were peaking for Tremblant and the weekend training load was heavy these days. Then I proceeded to crash, at high speed a few miles into the actual charity ride. Another rider and then a police cruiser stopped to check me out. I am thankful for that… The bike looked a wreck, and all my limbs and chest was scratched up and bleeding all over. First I asked for a ride back to my parked car in the police cruiser, and earned quickly that you don’t get rides in police cruisers on request… Then I changed my mind. Instead, I walked down to the little lake next to the road. I washed up there and fixed the bike as much as I could. It all took me half an hour or so. Then I went on and rode the Prouty course. Quitting a cancer charity ride felt wrong. By the end of the ride, I had a full inventory of the scratches and bruises, and the damage to the bike. It took a while to recuperate from the crash, and to get parts in for the bike and rebuild it. The deep quad bruises have lasted well past Tremblant, and a chunk of that muscle is permanently torn, visible just by looking at my thigh. What is the moral of the story? Be careful out there. Tri bikes are barely road-worthy outside closed circuits, perfect surface conditions and dry weather. I have raced Syracuse 70.3 before, as training for IM Mont Trembant. Same idea this year, take advantage of a well-organized race, held nearby, and use it to prep for the A-race of the year in Tremblant. 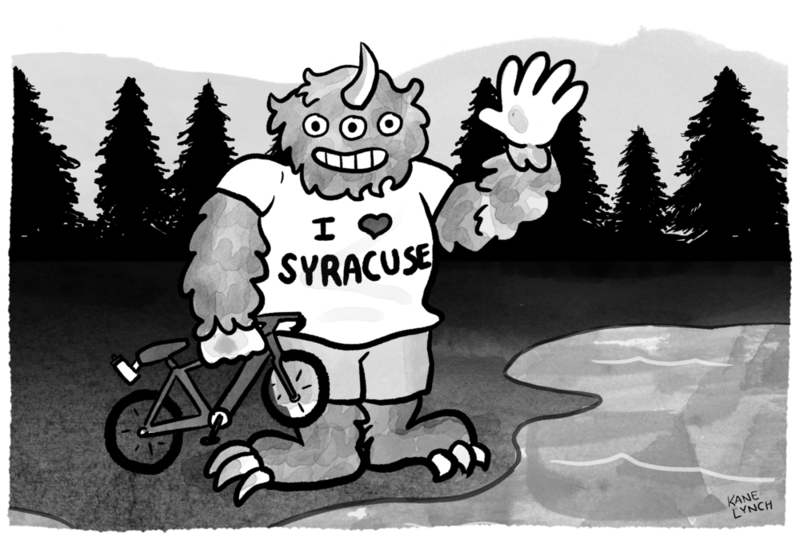 Syracuse offers a wetsuit legal lake swim, a hilly and beautiful bike ride and a rolling run (since they left off a major hill starting in this year). It is a low-key event without a pro field. For these reasons, and as it is a half distance race, it should not be much of a problem, right? Forget it, Syracuse turned out to be the hardest thing I have done this year. I could hardly finish… I was more cooked at the end of it than after a full distance race. The carnage was all over the field, it wasn’t just me hurting. Impossible to say why. No race should be underestimated, taken for granted. They have a way of getting back at you. More than a month has passed since the African Championship in Nelson Mandela Bay / Port Elizabeth. What remains? This is now my third year in the sport, and SA was my ninth full distance race, most of them in remote places. There is some calm settling into my race travel and onsite protocol. The madness of airports excluded of course… Because of that calm, I get to experience more of the location. So what really remains of this African race are the memories of brief encounters with locals, short sequences of them doing whatever they do every day. Through these encounters I got a feel for where SA is today, where it is heading, how some people feel… Not that these are necessarily correct, balanced views. But they are personal, conveyed in private dialogue and therefore carry weight. I have also memories of even briefer encounters involving some of the reigning kings and queens of this sport. Crossing paths at airports, on training runs, during the race… These remain just curiosities. The most important thing coming out of SA is a decision to not go to far away races without family. I missed them dearly in SA. This is a decision that has been brewing for a while, and now I am making a commitment to share these experiences with them in the future, because what is most memorable about these races is also shareable. The race itself contributes a tiny amount of the memories, most of which come from “being there” which is easy to share. So I will, from now on. With that, I pulled out of the next race planned in Australia, replaced it with a late season “racecation” in a beach location south of the border. We may even have snow on the ground by the time this race rolls around – same as with this beautiful race in SA. It will be good to get out of the cold and go to Mexico, together. There is snow on the ground at home. Another 4 inches have fallen today on top of the foot that winter left behind. This is our normal weather this time of the year, for 4-5 months. I am in a heated car now, wearing four layers, including a down jacket. In 9 days, I will be racing on the southern tip of Africa in 80-degree weather. Some of the bikes will be covered in zebra stripes or leopard spots. I will be wearing a skintight speedsuit, made of angel sneeze or fairy fluff or whatever Castelli is making speedsuits out of. I have just spent this entire day explaining a super smart executive how to sell a product that I have never used, never even touched really, in a country I never been to and know next to nothing about. I was told we nailed it, and got some serious kudos for the work. In 9 days, I will be riding my bike, running, swimming, exactly the same way as I always do, happy, staying in my comfort zone (generally speaking, you know). My result will be the best I can deliver, but mediocre compared to my competitors. There won’t be any kudos and the reward will be a polyester t-shirt that I will likely never wear. 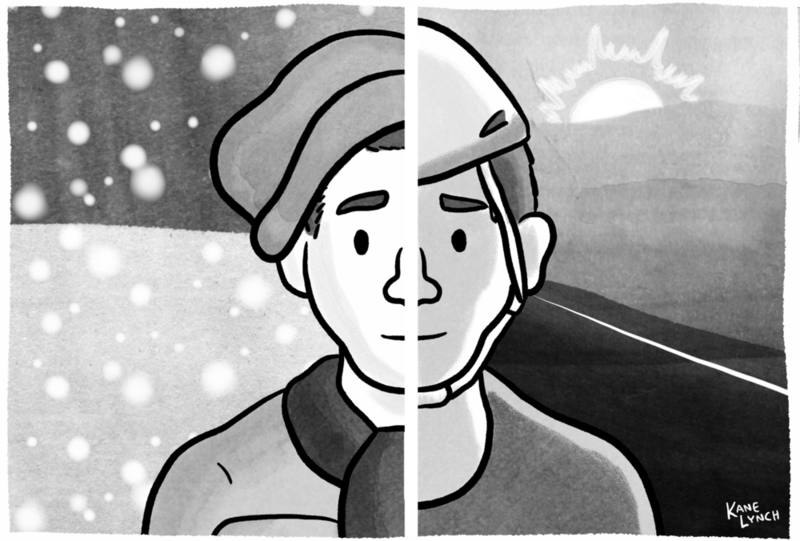 So, what is real and true? Which world do I belong to? “Daddy, that was a happy day”, she said a few months after IM Nice. That remark took me by surprise, as our four-year old was going through a particularly grumpy phase. “And why was that a happy day?”, I probed. It dawned on me then that my kids rarely see people enthusiastically cheering on strangers, especially while those are engaged in an activity that is not particularly graceful – like running the last legs of a very tired marathon. “Rarely”? Make that “never”. The Ironman finish line or turn around point on the run – practically the same place – is where the spectators conglomerate for good reason. The spirit of the place is electric, and gets more so as the day passes, reaching crescendo around midnight. My wife declared that if she ever does IM, she will want to finish at midnight, to experience that midnight atmosphere from the other side of the barricade. As usual, she may have the right idea here. It feels good that random people will call out your name (or something resembling it, if you have an unusual one), cheering you on. It really does help. It lifts you up when you need it the most during that long day. You wander what would it be like if this spirit would not be limited to finish lines at long races? What if that was the norm in everyday life? Would it be any harder to approach things, to see others as we do on that finish line? What makes it happen there and not in other places? The sight of our tired great ape shuffle on asphalt? All the lycra? So, you have made up your mind about tri, and started training. Here is a progression from the beginning to where it may end up going. First, you will likely do one thing a day (like a run or some biking) with some rest days every third or fourth day perhaps. Next, you will have some days when you do two sports, more of one, a bit of the other. You will rest some days still. If you intend to go beyond this point, you will probably want to hire a coach (if you haven’t done so yet). Or use training plans available online or in books. It is because you start to spend real time training and you will be probably unsure about how to optimize and structure all that time invested. A coach or a good plan can help. My vote goes to the former, though. Third, you will probably find yourself doing two things most days, and eventually the rest days will be gone. Fourth, you will be acquainted with the notion of “long days”. These will usually be weekend days, when you will do a lot of one or two things. Like a really long ride, followed by a real run. Fifth, if you had not done so before, this is when you will start to add massage, chiropractor, yoga, Pilates, core strengthening exercises into the mix. All that training will make such preventive maintenance necessary. You are training hard at this point, doing real work every day, with great plans for big races and PBs. Most importantly, you will be getting that feeling of profound satisfaction, every time, all the time when training is done. First step I guess is to get active, get into some sort of sport. I got that from my upbringing, I was always involved in one sport or another, never too deeply, and at times very superficially. Second step may be to become interest or downright passionate about a particular sport, doing it frequently, trying to get better at it. This was biking for me, which I started doing as a commute around 2003, and fell in love with around 2005, when it became more than a form of transportation. The next step for me was to start measure athletic performance, like tracking speed, distance, or some other form of endurance. Knowing what your best is, and trying to beat it when you can... In my case, I started to pay attention to my average speed on a certain route. I then realized that one sport is not going to cut it, and added in another. I started running, to improve my cycling. I am not sure it made me a better cyclist, but I certainly fell in love with running. The fifth step was to develop interest in participating in events, and racing. The first events will likely not be triathlon races, but more likely a run, or a bike event, maybe a duathlon. I did some hill climb bike races, and signed up for a few charity bike events. Then comes the turn to triathlon, becoming hooked on the idea of it. This can happen through the nudging of a friend, making a promise impulsively while not thinking straight, watching the Kona recap from last year, or some other way. For me it was the Kona films. The consequence of the previous step, the tipping point really, is to start practicing the triathlon discipline(s) that you are weak at. I had to learn to swim. Then comes the plunge: Getting on some sort of a triathlon training plan, probably with a race already picked. It is a good idea to sign up for that race now. I signed up for IM France, nine months out, and started to take swim lessons, and got some organized triathlon training going. It was a homemade plan, that worked fine initially. More about this last step next time, how to get training going. So in short, a path can lead through all these gyrations I have recounted above. Or somebody may just sign up for a triathlon, then stand up from the couch and go find that old mountain bike in the basement. Whatever the path is, it is a path worth walking down on. The joy of training. Really? I enjoy training in the rarest of occasions. I train every day, yet I can count on two fingers the number of times I actually enjoyed it while doing it. Yoda has an ability to prescribe training that feels torture and pushes me to my physical and mental limits almost every single time. it is hard to find fun in this mix of sweating bullets, drooling, gasping for air and very nearly blacking out. But once I have completed said training session, I get a feeling of profound satisfaction, every time, all the time. I receive a large dose of happiness from getting serious, challenging work done, every day. I work hard and try hard to excel at my job, or even jobs. I try hard to be a good father and husband. But I rarely know if I succeeded, if I tried hard enough. I am left permanently wondering. No such uncertainty in training. There are two things about Ironman that have captured me and kept me captive for some while now. The first is the training. The other is the last hour around the finishing chute. There are many other things to love about the sports and Ironman events specifically - the people, the locations, the impressive organization, etc. - but training and the midnight chute top my list. Both deserve a full post or more - and they will get that longer treatment eventually. But here is my take in a nutshell. Training for long course, no matter what the time target, is the life changing aspect of the sport. It will require some reorganization and reprioritization of every day. It will require a deposit of time and energy (and sometimes money) every day. It is also what upgrades body and soul. The change comes from the work, these regular "deposits", not from the finisher medal. The finishing chute late in the race is where we celebrate the accomplishment of that positive change. The finishing chute is The Happy Place, the center of it all on The Happy Day. More about "The Happy Day" later. This is when those who had it the toughest that day come in, and we get to cheer them and applaud them. The girls and I make the point of being there around the seventeenth hour, if at all possible. It is always the highlight of the day. We have tested power on the bike yesterday, and it confirmed what I suspected after testing run speed a few weeks ago. Power is still off, by a significant margin, below where we were a year ago. There is no explanation, just the confirmation that I have not yet climbed out of the hole I found myself in in Langkawi. What is the significance of this, why is this worth typing up here? Nothing really, it just shows the silly things I worry about, taking the sport a bit too seriously. I never had much power, now I have a bit less, and in a few months I will have undoubtedly a bit more. For the outside observer the difference is whether I ride "slow", "kinda slow" or "not that fast". What matters is that I am keeping active, training an hour or two every day, and it feels good. That I will be participating in some fantastic races soon enough, in some of the most beautiful places in the whole wide world, with people that I - at the end of the day - like and identify with. It matters that I would love to get in a training ride or two in California, on 101 in Santa Cruz, or that costal bike trail south of LA, or somewhere in Marin. The fact that I desire something that wholesome matters. It also matters that I may actually be able to get in those Cali rides soon enough. But back to power for a second, I can't leave that topic just like that, right? Here is my action plan: I will finally remove the remnants of the Langkawi race number sticker from my bike. There can be some bad modjo going on here... Also, I will swap a black bottle cage to a red one as soon as possible. The order has been placed, and I am waiting for delivery. That change will certainly add free speed.